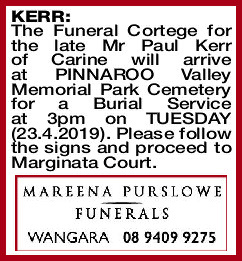 The Funeral Cortege for the late Mr Paul Kerr of Carine will arrive at PINNAROO Valley Memorial Park Cemetery for a Burial Service at 3pm on TUESDAY (23.4.2019). Please follow the signs and proceed to Marginata Court. Lots of music memories, will never forget the great times we had. I am sure you will be playing with your music idols. In Loving Memory, Will Miss you and your sense of humour, always a good Chat and a laugh. We all at times have enjoyed your company and will miss you greatly. The Copeland Family have at different times in your life met and travelled with you and all have asked to say their goodbyes and will miss you greatly. 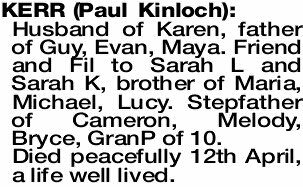 Sympathy to Karen, Maria, Michael, Lucy and all The Family. Rest in peace and hope you have that Glass of wine and God bless. Husband of Karen, father of Guy, Evan, Maya. Friend and Fil to Sarah L and Sarah K, brother of Maria, Michael, Lucy. Stepfather of Cameron, Melody, Bryce, GranP of 10. Died peacefully 12th April, a life well lived. 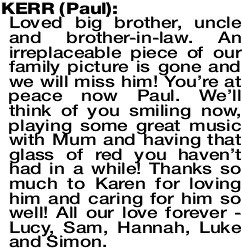 KERR PAUL Loved big brother, uncle and brother-in-law. An irreplaceable piece of our family picture is gone and we will miss him! 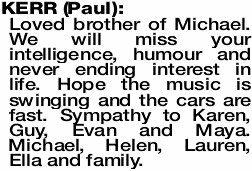 You're at peace now Paul. 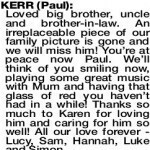 We'll think of you smiling now, playing some great music with Mum and having that glass of red you haven't had in a while! Thanks so much to Karen for loving him and caring for him so well! All our love forever - Lucy, Sam, Hannah, Luke and Simon. 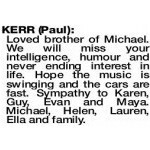 KERR PAUL Loved brother of Michael. We will miss your intelligence, humour and never ending interest in life. Hope the music is swinging and the cars are fast. Sympathy to Karen, Guy, Evan and Maya. Michael, Helen, Lauren, Ella and family. Farewell loyal and trusted friend of 59 years. 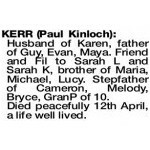 Deepest sympathy to Karen, Guy, Evan, Maya and your many loved ones. Rest in Peace.